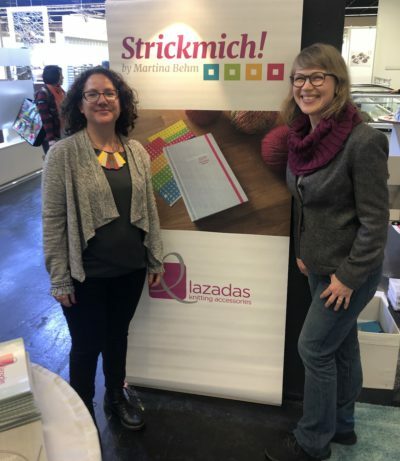 Blocking wire sets and innovative knitting accessories of the highest quality, imported from Israel – that’s Lazadas, and I am proud and happy that we carry them in Strickmich! Shop. 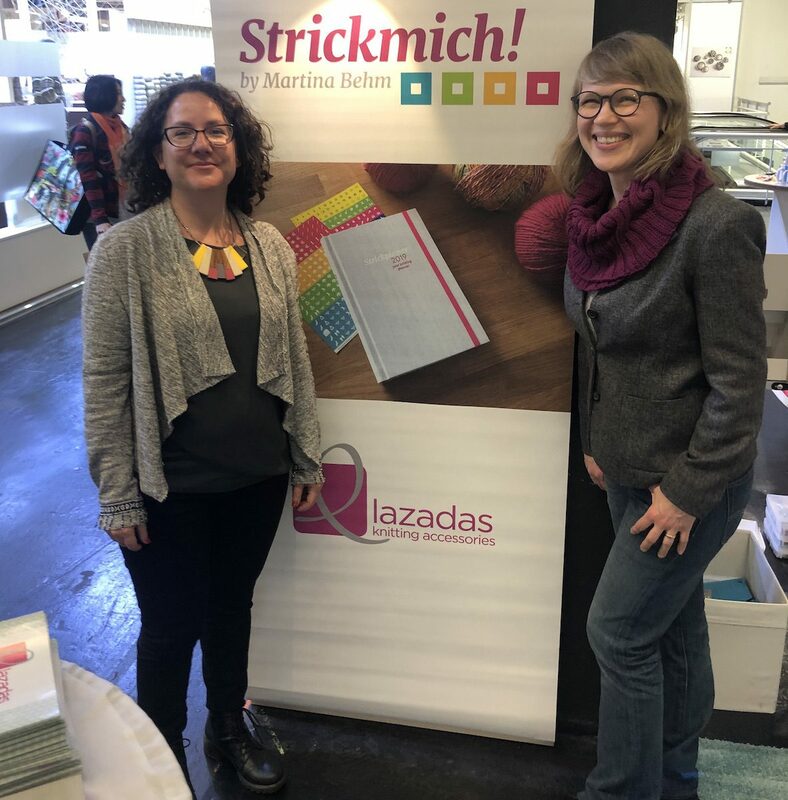 At h+h cologne, the world’s largest fair for creative handicraft and hobby supplies, I have taken the opportunity to interview Astrid Lapidus, founder of Lazadas. What’s the idea behind the Lazadas blocking wires? What makes them different from others? After using “conventional”, rigid blocking wires and about 20.000 T-pins to block only one half-moon shaped shawl, I felt frustrated and thought “there must be another way”! 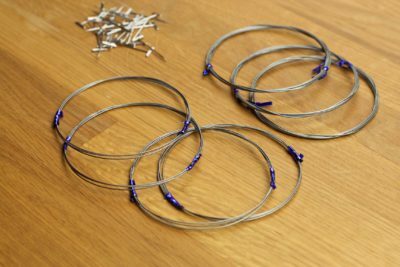 Months later and after a lot of study and trials I developed the super flexible blocking wires: adapting to every shape, rust-free and making the process of blocking fast and easy. You live in Israel, but your blocking wires are in the process of conquering the entire knitting world. Where are they already available? How does that make you feel? I am proud and honored that we produce high-quality knitting accessories in Israel and reach thousands of knitters around the world. You can find Lazadas knitting accessories at exclusive yarn shops all over the world. How did the famous Project Caddy come to be? Why did you choose such vibrant colors? This is a funny story. With my friends, we use to meet and knit at bars in Tel Aviv. But putting the project bags on the table seemed no good idea because of the drinks, and placing them on the floor didn’t seem to be an alternative either – because of the drinks. Then, the Project Caddy idea was born. 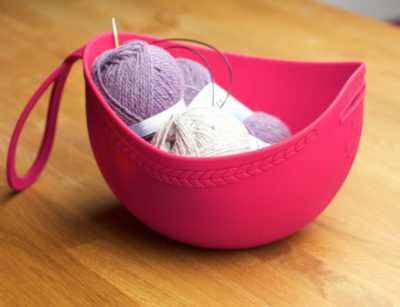 Waterproof, handy, versatile and pretty to match every fancy yarn. Jewel tones are my favorite! You are originally from Argentina. 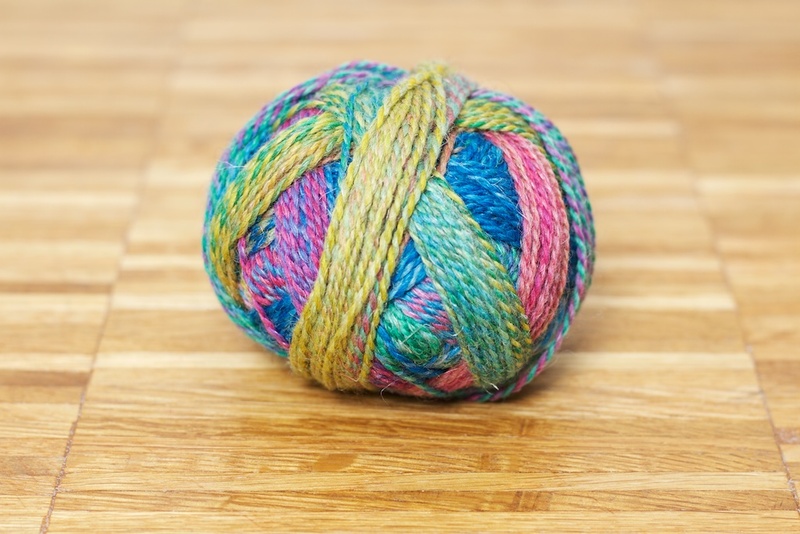 Is having an international background an advantage when it comes to understanding the needs of knitters around the world? I think that experiencing different cultures and languages opens your mind. In fact, every time I travel, I try to attend a local knit meeting. I find the fiber community very welcoming, like a sorority. The blocking wire sets are produced in an inclusive workshop in Israel. How did that collaboration evolve? What do you like about it? We work in cooperation with ENOSH, the Israeli mental health association. The workshop is located in the Arab city Umm al-Fahm. It’s very important for me an inclusive work environment where men, women, Jews and Muslims work together in peace. I hope in the future, more politicians will think like us. So cute, so useful and totally indispensable: Strickplaner – your knitting planner – has become a vital part of many knitters’ lives around the globe. I myself can’t imagine life without it, and so I am really happy to announce that we decided to go for another edition in 2020! 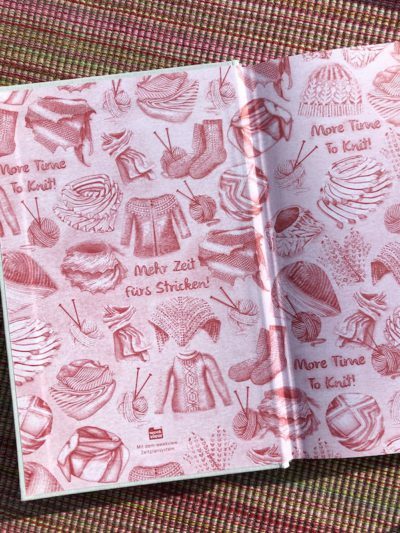 We will feature the pretty endpapers by artist Julie Levesque, the very robust cover with a textile feel, the beautiful berry-colored details, an elastic closure, ribbon bookmarks and high quality paper. As in the past years, we would like to invite the knitting world to be part of Strickplaner and support this project through sponsoring. 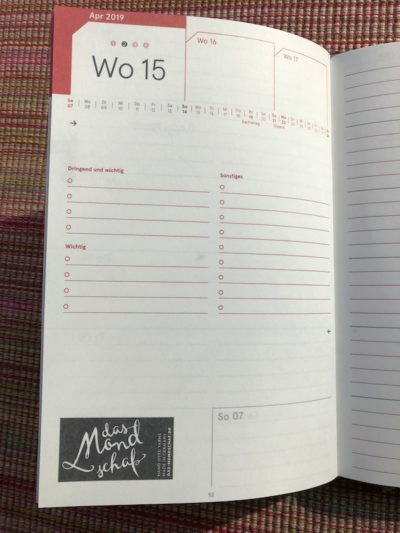 If you would like to be present in many knitters’ everyday lives, our weekly inspirations, banner or full-color pages are perfect for you – whether you are a dyer or yarn brand, accessory maker or desginer. 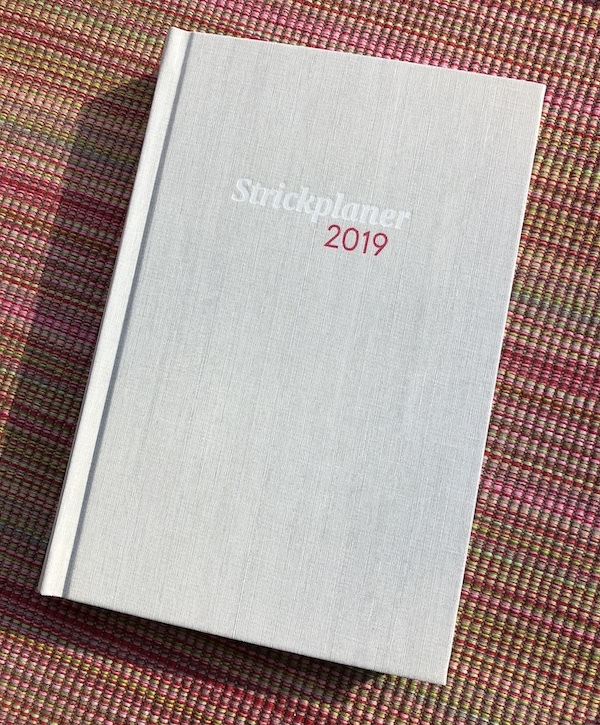 Drop me a line at planner (at) strickmich.de, and I will send you our media kit! 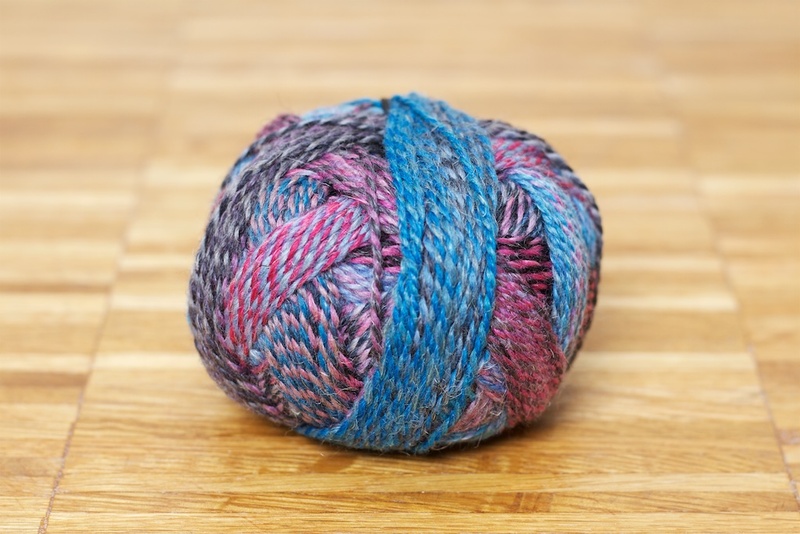 Gradient yarns are fascinating, and the fun doubles when you use two of them together: The constant color changes will produce new interesting stripes every couple of rows. 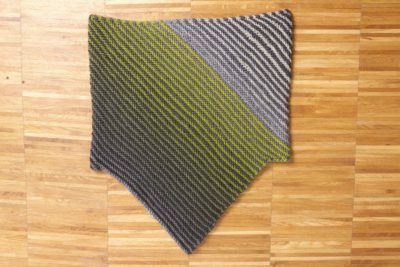 Knit on the bias in garter stitch, this cowl makes use of a clever construction, resulting in a useful shape that will keep the back of your neck and your front warm and cozy. 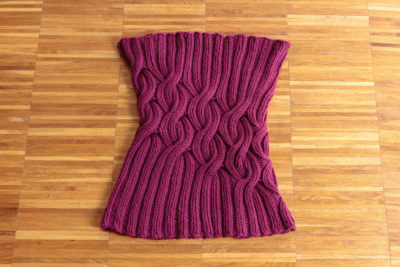 This pattern was originally published in Jen Arnall-Culliford’s book “A Year of Techniques” in the chapter teaching you how to do a provisional cast on and garter stitch grafting. 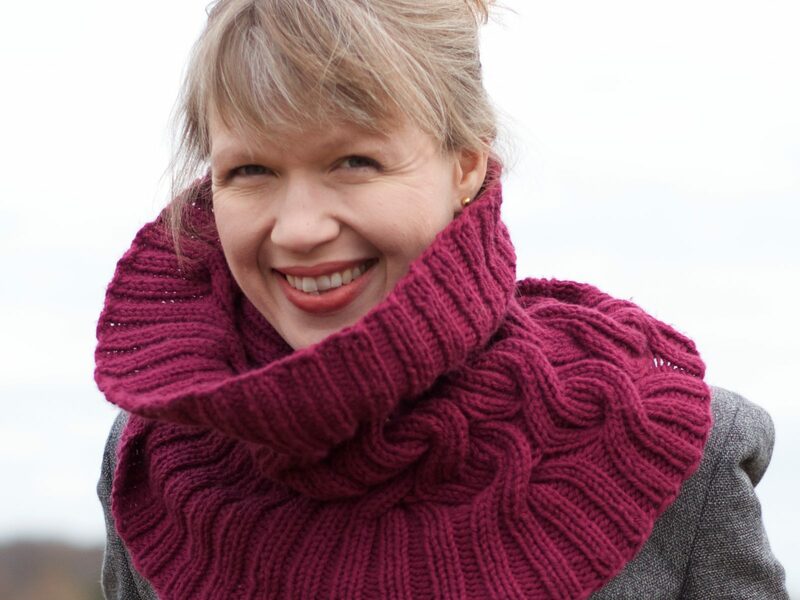 The pattern is now available on Ravelry and in Strickmich! Shop as a download and printed version. In Strickmich! Shop we carry the beautiful yarn “Schoppel Gradient” in lots of gorgeous colors, as well as kits in the color combination of the sample (“Schatten” and “Gelbfilter”). 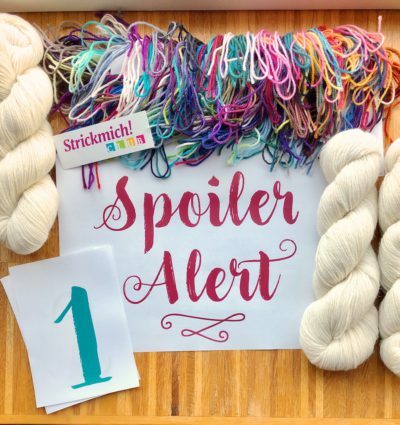 Here it is: The first virtual cast-on event of Strickmich! Club 2019. Enjoy! P. S.: And don’t forget to watch us live on youtube at 12 noon German time! Links to external pages vimeo.com and youtube.com. 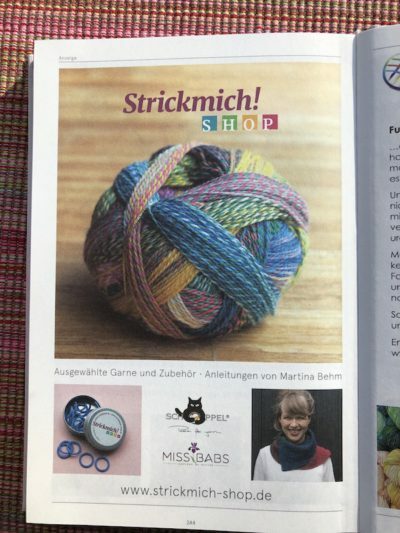 Strickmich! : In Germany, reports about mulesing in Australian Merino sheep are in the news right now: The sheep’s skin around the buttocks is cut off without any painkillers. The practice has been widely criticized for a long time. Are only Merino sheep in Australia affected? Patrick Gruban: Yes, Merino sheep are bred specifically to yield the maximum amount of fiber, so they have lots of skin and many skin folds. Into those folds, flies can place their eggs and maggots emerge, especially in the buttock area – this is called “flystrike”. 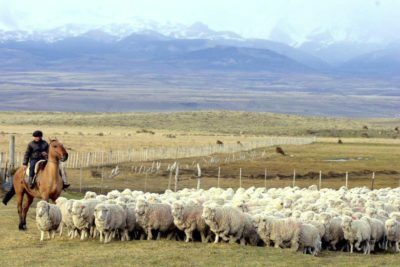 Mulesing is not used in other sheep breeds. Why is it only common in Australia? The fly species that harms sheep only exists in Australia and New Zealand. 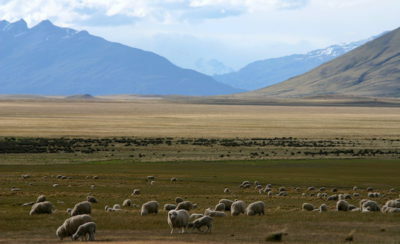 Sheep in South Africa and South America won’t be affected. 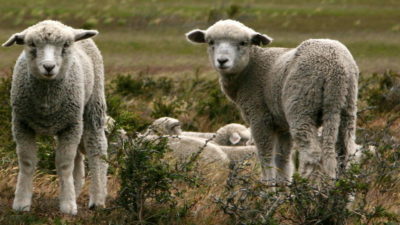 In New Zealand, farmers have made an effort to breed Merino sheep with fewer skin folds, so the problem of flystrike is not as pronounced there. New Zealand has also developed other methods to combat the flies, and last year they passed a law that prohibits mulesing entirely and sanctions it with heavy fines. What are alternative methods to prevent flystrike? If the farmer monitors his flock closely and checks on his sheep regularly, he will notice if anything is wrong and can take action. In Australia, flocks tend to be very large, they roam freely, and are often only monitored by helicopter. The farmer usually sees his sheep twice a year for shearing. Instead of cutting off the sheep’s skin, one could simply shear the area around the buttocks several times a year, so it would stay cleaner and attract fewer flies – but that would be a lot of work, and very expensive for Australian farmers, so only very few do it. No, but if there is a lot of wool growing on the skin, flies won’t find it so easy to reach the skin to lay their eggs. So it’s not such a big problem in other areas. Would you consider if progress if anesthetics were used during the mulesing surgery? It’s not clear how much that would help – the sheep would certainly feel pain until the wounds are healed, which can take several weeks. But it would certainly be a step in the right direction, especially as the problem has been known for years. 70% of all mulesing still happens without painkillers – in my view, that’s outrageous, and can only be explained by farmers’ focus on profits and their greediness. The price for Merino fiber has gone up by 50% during the past years, so they would still earn enough if they were to spend a small amount on anesthetics. Sure, especially as Australian sheep farmers have been aware of the problem for more than 15 years. In 2004, there was an initiative to get rid of mulesing until 2010, but that date has passed and nothing has happened. It is always hard to change things when it comes to animal welfare – we see that now in Germany, where the government is trying to pass a law against neutering pigs without painkillers. It takes forever to reach a consensus. 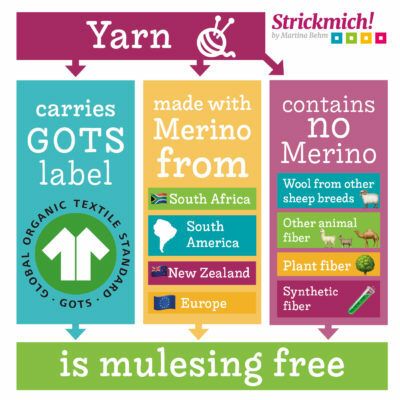 So, if I wanted to buy Merino yarn that was made without mulesing, I could just make sure that the fiber comes from South America, South Africa or New Zealand? Yes, but that can be difficult, as very few brands can give detailed information about the origins of the fiber or even the sheep breed they used. Some just put “wool” on their label and won’t tell you it is Merino that could be affected by mulesing. 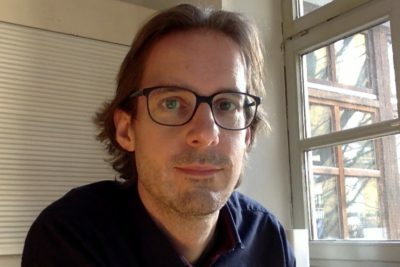 Sometimes the supply chain is so long and obscure that it is impossible to tell where the fiber came from: The yarn brand buys from the spinning mill, the spinning mill from a fiber wholesaler, the wholesaler from the producer and so forth. With hand dyers who buy their yarn from a yarn wholesaler, there is an additional step involved. The whole chain relies on trust: The yarn brand or dyer says the yarn is mulesing-free, but cannot really prove it. However, 90% of all Merino fiber worldwide is from Australia, so you need additional proof that they are not part of the yarn you are buying. That’s why we decided right from the beginning that we needed the GOTS certificate – Global Organic Textile Standard. We are also aware how hard it is for hand dyers to find certified yarn bases, so we decided to offer our yarn to them, too. If you make a statement like “our yarn is mulesing-free” you kind of lock yourself in, and become less flexible in case of a shortage. At Rosy Green Wool, we cannot use other sources for our Merino fiber and have to make long-term contracts with the suppliers from South America, stating how much we will buy in the upcoming years. That’s quite a risk. For us, it’s even harder as we are the only yarn brand in the world that offers only GOTS-certified yarns, so we cannot use cashmere or silk in our yarns as they are very hard to come by in that quality. 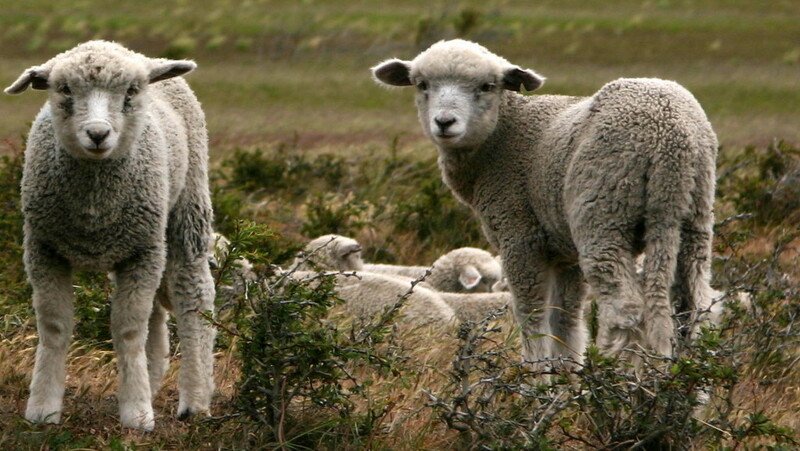 Are hand knitters more aware of mulesing than consumers who buy ready-made clothes? 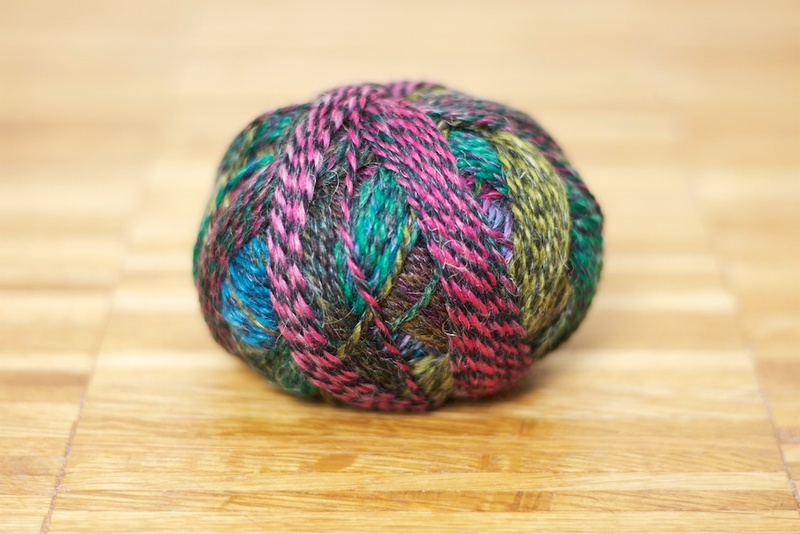 Yes, especially those who are interested in high-quality hand knitting yarns. But according to my estimates, more than 99.5% of all knitting yarns sold in Germany are still not GOTS-certified. A couple of yarn brands might be in the clear without a certificate because they have a short supply chain, or personally know the farmers providing their wool, and offer mulesing-free Merino – but in the end, they lack the transparency that only a label can provide. Has the attitude of handknitters towards animal welfare changed since you started out with Rosy Green Wool in 2012? Mulesing as a discussion point comes up roughly every five years, but I think that’s not enough. We often hear from people who say they became aware of the problem through our yarn, and that they decided to pay more attention to whether a yarn is certified or not in the future – that’s a huge compliment for us! • no chemical moth-repellants were used. 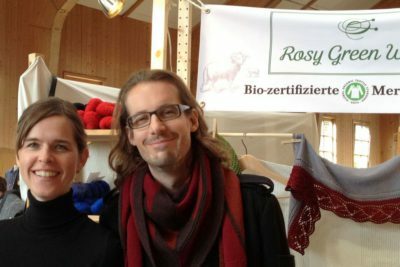 Was started in 2012 by Rosmary Stegmann and Patrick Gruban in Munich, and launched Germany’s first GOTS-certified machine-washable Merino yarn for hand knitters. Rosy Green Wool is the only yarn brand in the world that offers only GOTS-certified yarns. During the past years, we have only been visitors at H+H – but this year we will exhibit, probably with the smallest booth this trade show as ever seen. We’re next to Strickimicki in Halle 2.2, Stand F29. Peter and I will both be manning our booth, we will bring my printed patterns and my knitted samples, Strickplaner and the beautiful knitting accessories by Lazadas. 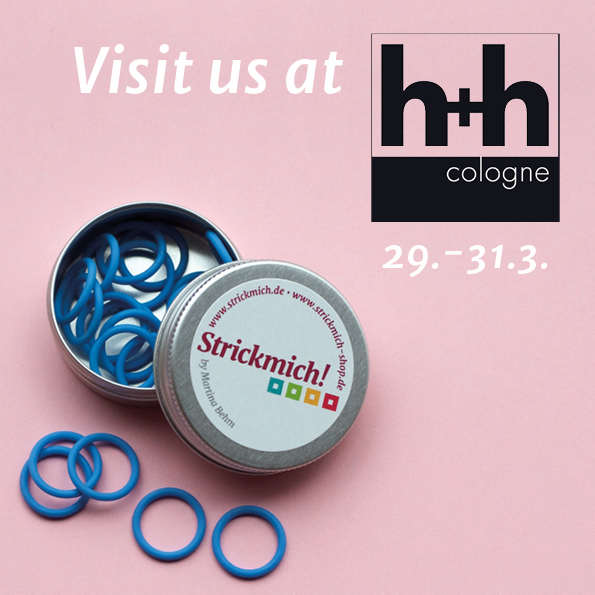 H+H Cologne is open from March 29th to 31st, and we will be happy to welcome knitters, bloggers and LYS owners at our little booth :) See you there! I have been living in an old pub in the northern German countryside for five years now. It was built in 1906 and remodeled in the late 1980s. It’s beautiful and I really love it, but the house is quite big (big enough to hold knitting events and classes! ), so we only turn on the heating in the rooms we actually use – plus the wood stove, of course. When I am sitting at my desk, I usually wear three layers of wool plus something cozy around my neck, and this big and beautiful cowl out of the soft and eco-conscious Aran-weight yarn “Big Merino Hug” by Munich based yarn company Rosy Green Wool is my new favorite: The reversible cables spiral elegantly around it, so it’s a little wider at the shoulders and narrower around your neck. Up or down, inside or out: just big and beautiful! 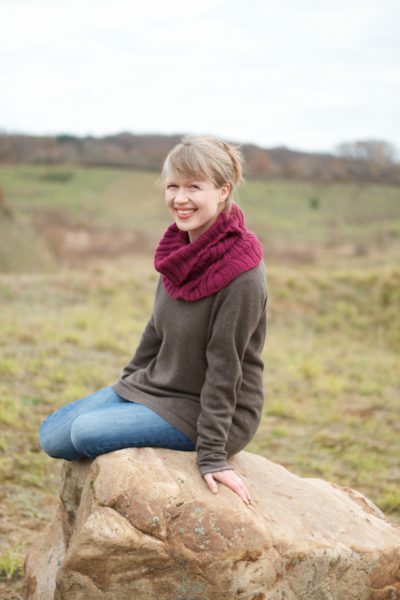 The amazingly soft organic yarn “Big Merino Hug” is available in Strickmich! Shop in 13 great colors, and we also carry kits. Shipping is worldwide! 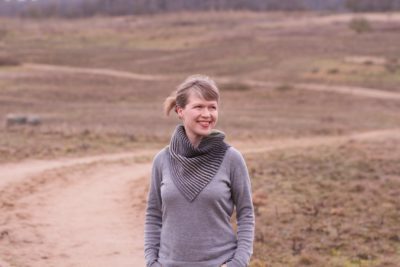 Take a deep breath, enjoy the view, walk a few miles in a bizarre landscape that was left behind by the gravel mines surrounding our village – that’s what I enjoy every day. 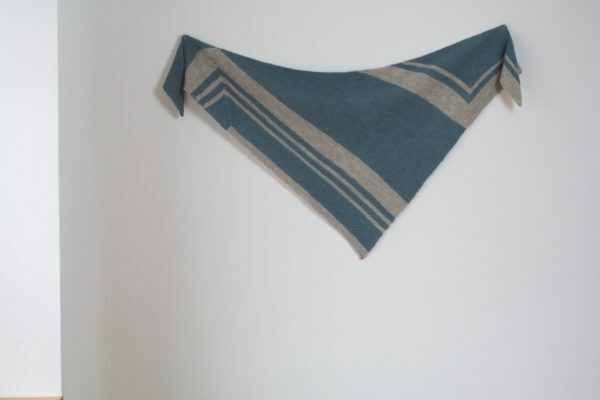 “Strider” is a scarf that has proven immensely useful during my walks: In the middle, it is pointy as a shawl for extra warmth on the chest, but the ends are square. 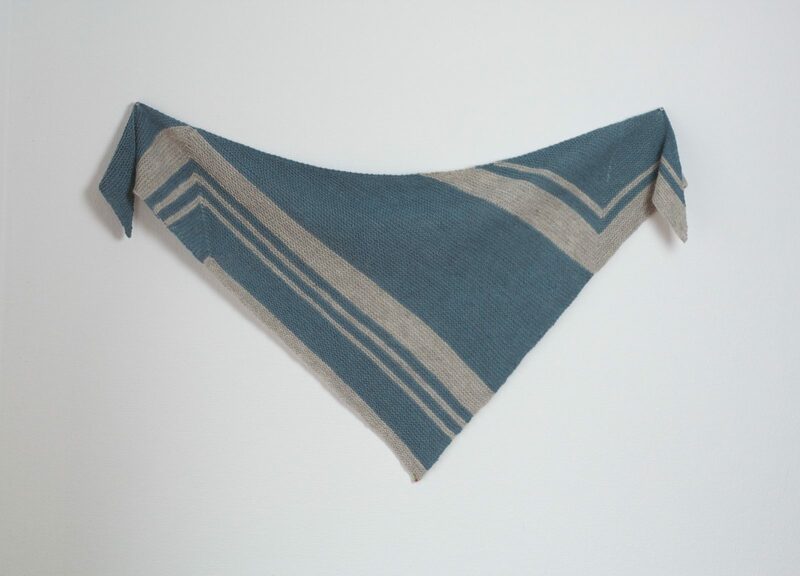 This fun geometric construction is accentuated by a pretty color-changing yarn. Entirely knit in garter stitch with super simple and short instructions, it is perfectly suited for a beginning knitter. 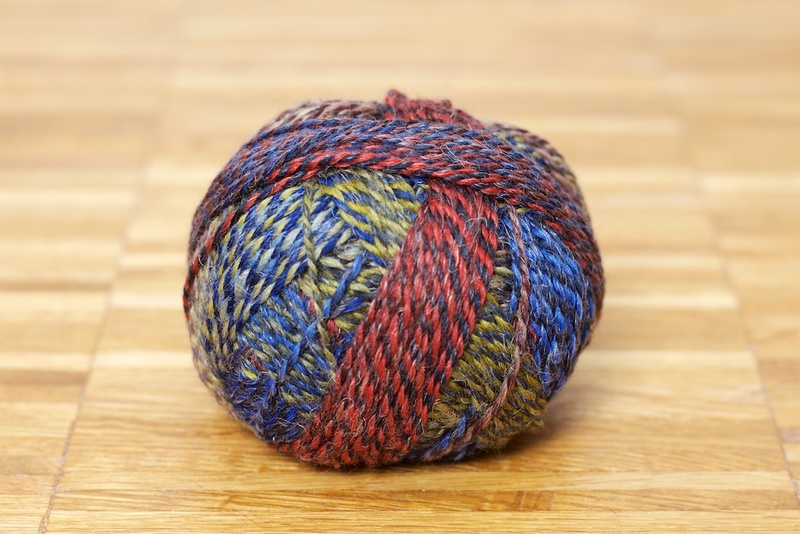 Bonus: You can make this bigger by using more yarn – just knit until everything is used up. 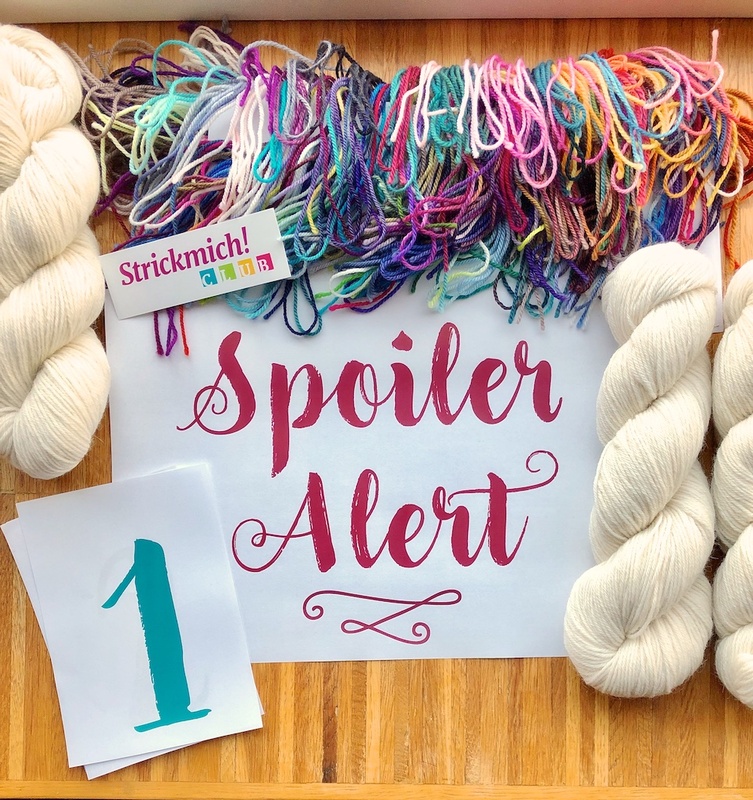 The yarn “Edition 3 Hanf” was spun for us in 4 exclusive colorways by Zauberball maker Schoppel and is only available at Strickmich! Shop. In Strickmich! Shop we also carry kits with 3 balls of the yarn (sufficient to make the scarf in the size shown in the pictures), the printed pattern, stitch markers and a Strickmich! fabric tag at a knitter-friendly price. 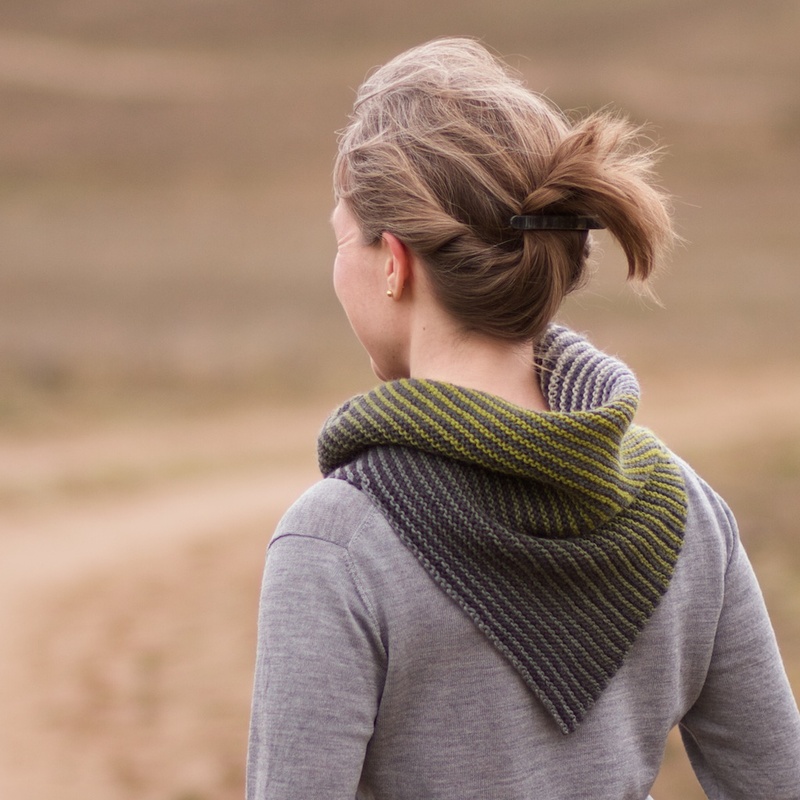 “Horizonte” (German: “Horizons”) is the name of this shawl that I designed for the second instalment of Strickmich! Club 2018. Just as looking at the horizon will calm your nerves and put things into perspective, this combination of yarn, color and simple to knit pattern will feel soothing and relaxing. I feel that this is just what you need when life is loud and complicated. 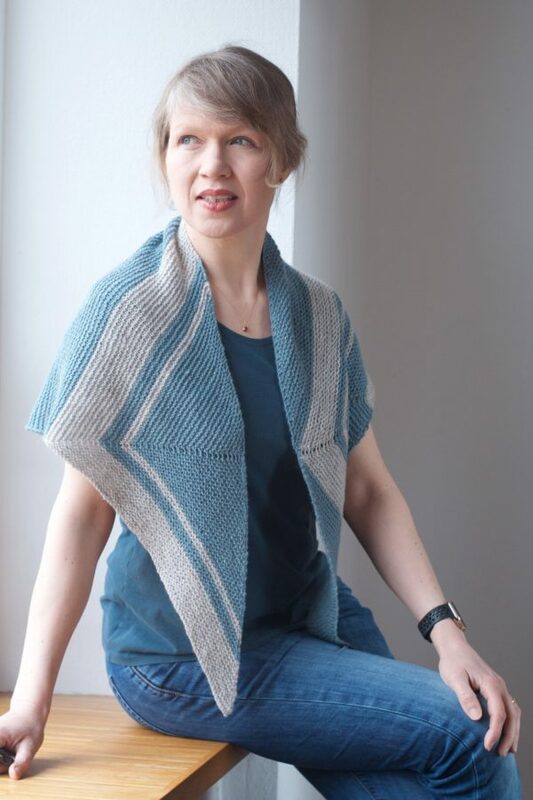 Horizonte is knit entirely in garter stitch, so it’s a very relaxing knit, but the construction with its different parts will keep you interested. The yarn “Blacker Swan 4-ply” is spun out of ultrasoft Merino fiber from the Falkland Islands combined with a small amount of colored Shetland wool, resulting in a beautiful heathered effect. In Strickmich! 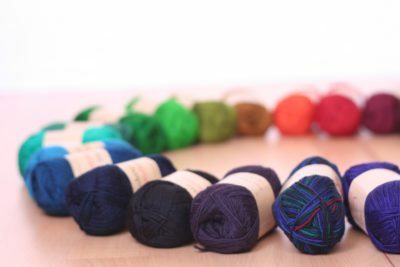 Shop we do have a limited number of kits with the yarn Sue Blacker had dyed exclusively for Strickmich! Club. And if you would rather choose your own colors, we do carry “Blacker Swan” in a range of beautiful alternatives. You will need 100 g (2 balls) of the main color plus 50 g (1 ball) of the contrast color (more if you wish to make your shawl larger). The pattern is available on Ravelry and in Strickmich! Shop (printed and as a download).